Thomas Mahon a native of Ballymote, Co.Sligo was fitted with his new Moxi Fit hearings aids. 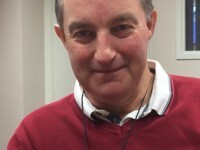 He says his new hearing aids have "given me a whole new lease of life". "I'd have no quality of life without my hearing aids". "They are just brilliant. Thomas is one of the may customers benefiting from this new technology, offered at both Sligo Hearing Aid Centre and North West Hearing Clinic. "My hearing aids have given me a whole new lease of life. It's a miracle what technology can do. I'd now be lost without them"
"If you choose Sligo Hearing Aid Centre, you get more than a hearing aid. Padraig is an excellent audiologist and treats you with kindness and understanding. He listens to your concerns and frustrations with hearing loss, then he does something about it. He works with you to return your hearing to the best level possible. To me, there just isn’t anyone better than Padraig." Our selection of Digital Hearing Aids Letterkenny & Sligo, includes Unitron's Flex:Trial. Try before you Buy! Our highly trained Donegal & Sligo audiologists have years of experience of ear wax removal. on Friday, 12 February 2016. We travel from Donegal to Dublin and Galway.